Not every recipe works out the way we’d like. For the most part, I share only kitchen successes with you, as I want you to have the best possible results. But every so often, I do make a recipe that doesn’t perform the way I hoped and I hold it back, writing it off as a learning experience, eager to move on to the next opportunity for pastry perfection. 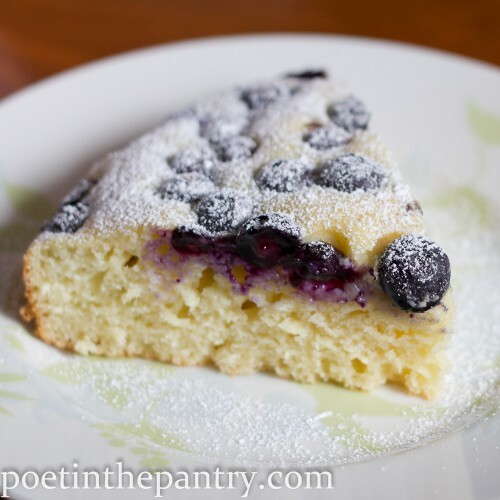 I’m sharing this Blueberry Ricotta Cake with you because I think what I perceive to be its failures may more likely be a failure in my expectations and that there is nothing wrong with this recipe. Sure, adapting an Italian recipe to English is full of challenges. And yes, the grade of flour used in Italy is quite different than what we can find in The States. But I don’t believe these are the problems here and I’m sure that others would find this to be quite tasty, as long as they know that it is not your typical sweet cake recipe. Yes, I did adapt an Italian recipe. I had my good ole friend Google Translator to help and while it’s not always perfect, often skipping over perfectly good words that it can’t seem to find an equivalent for or putting together quite awkward phrases, the gist gets across. Far better than if I had to try to translate on my own, seeing as I only have a vague recollection of French from 3 years of high school study. Not helpful here. The thing is, there were some things that needed to be converted, other than the language. Like packets of baking powder. What the heck is a packet of baking powder for cakes? How much is that exactly? Why don’t they just use baking powder like we do, in normal fractions of tea- and Tablespoon measurements? There are, apparently, different packet sizes, further adding to my confusion. The closest approximation I could find is that 1 packet of baking powder equals 1 Tbsp of baking powder. Maybe? Hopefully. Then there was the metric stuff. You know, what the majority of the world uses and we stubborn Yankees refuse to conform to. My sources calculated 180 degrees Celsius to be 356 degrees Fahrenheit. I opted for 350 degrees in the final recipe, choosing to err slightly lower, just to be safe. The end result is a beautiful cake, perfect for presenting to guests. Nice crumb and the blueberries even stayed on the top! But it just didn’t seem sweet enough. My daughter enjoyed it, but she’ll eat just about anything. If any of you try baking this, I’d be interested in hearing your feedback. Is it just me? Did I make a really bad attempt at adaptation? Or is there something that got lost in translation? Preheat oven to 350 degrees Fahrenheit. Grease and flour a 9″ round cake pan and set aside. In a large mixing bowl, measure out the flour and mix in the baking powder. Set aside. In another large mixing bowl, slowly combine the ricotta and sugar with a whisk, making sure the sugar dissolves completely before moving on. Stir in the coconut oil and then the eggs, one at a time, making sure they’re fully-incorporated before adding the next one. Stir in the milk and lime juice. Slowly add the flour mixture, stirring only until just combined. Pour mixture into the cake pan. 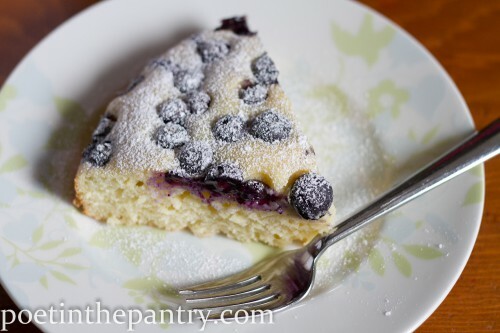 Sprinkle over the top the lightly-floured blueberries (lightly flouring them prevents them from sinking to the bottom of the cake). Bake for 30 minutes, or until lightly browned on the edges and a cake tester comes out clean when inserted in the middle. Allow to cool completely. Just before serving, sprinkle with confectioner's sugar. I was so honoured to read about my cake! – about the oven: I used a static one and 350 degrees are ok!!! I don’t know how is coconut oil, but next time try to use clarified butter! Thank you for stopping by–and for answering the question as to how much exactly a packet of baking powder is! 🙂 Coconut oil can often be substituted for butter in baking, hence my use of it. Perhaps I should try clarified butter next time. Thanks for the tip! Glad you posted it because it doesn’t look like a failure to me, looks delish!!! Ah-hah, at last an answer to the baking powder packet conundrum. Thanks so much, I’ve something to work with now. I actually saw packets of baking powder the other day for the first time–how odd. But yes, that was quite the puzzler. Glad I could help! What are you making? Italians eat cakes like this for breakfast, not dessert, and their tastes aren’t as sweet as Americans in that regard. We would definitely not substitute coconut oil for butter, as real butter in moderation is considered healthy. You did a great job with the translation! Amazon has the packets by the way. I don’t have a problem with butter. I’m a huge fan of it, especially the good grass-fed Kerrygold kind. But I can’t share someone else’s recipe verbatim (not only is it wrong, it’s illegal), so I needed to do some sort of adaptation and coconut oil is a healthy fat, too. But that does make sense, on the difference in preference for sweetness and when a cake like this would be served. Thank you!